The Florida rushing attack hasn't exactly set the world on fire in 2015. Jim McElwain's stable of runners has only one gain of over 40 yards on the season. The group as a whole are running to the tune of a 3.5 yards-per-rush average. 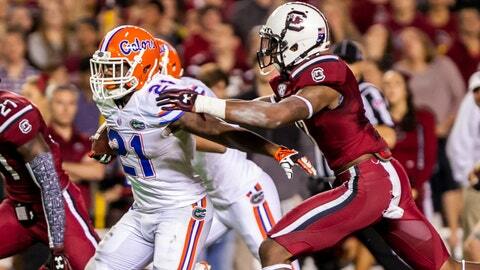 In SEC play, the Gators are rushing at a paltry 2.86 yards-per-carry clip. According to running backs coach Tim Skipper, it could be a case of Florida's backs not being able to make the last man miss. This could account for the lack of big yardage gains in the run game. Additionally, he feels as if the offensive line could stand to improve when it comes to run blocking. He's hopeful the insertion of talented freshman Martez Ivey at left guard will galvanize the efforts up front. Against a tough Georgia defense this weekend, Florida will need to have balance on offense. If the running backs aren't churning out yards, don't be surprised to see Treon Harris get involved more rushing the football on zone-read looks. "We have to make that last guy miss," UF running backs coach Tim Skipper talking about he lack of explosive runs. Skipper called freshman OL Martez Ivey a 'big-time player,' said finding a spot for him a left guard will benefit him and the #Gators. #Gators RB coach Tim Skipper said both OL blocking and RB finding lanes have combined for run game woes (2.86 ypc in SEC play).